Keep human medications and foods that are toxic to cats and dogs out of reach (particularly dangerous foods are chocolate and onions). Toxic plants, particularly mistletoe, holly, and lilies, should also be placed out of reach. Don’t leave winter chemicals such as antifreeze that are extremely dangerous to pets anywhere animals might access them. While still poisonous, propylene glycol-based antifreeze is not as toxic as the traditional ethylene glycol-based product, and thus reduces the risk of fatal poisoning. If adding chemicals to extend the life of a Christmas tree, make sure that pets cannot access them. Supervise pets (particularly kittens) around fragile glass Christmas ornaments. 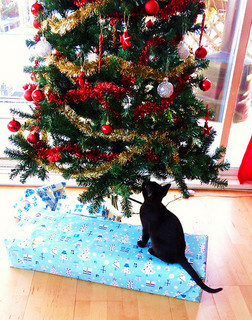 Ideally, ornaments should be large and unbreakable for safety, especially when spending Christmas with young animals. Cats and dogs, and particularly kittens and puppies, may chew on the electrical cords used to power Christmas lights. Cords should be located out of reach or at least covered. Don’t use loose Christmas tree tinsel, as pets may swallow it and suffer intestinal blockage. Icicles made out of solid material are a better choice. Anchor the Christmas tree well so that there is no risk of pets pulling it over. Avoid buying anything for cats that has small pieces which could present a choking hazard (see How to Make Cat Toys for more information on cat toy safety). After unwrapping gifts, remove ribbon and other items that pets might swallow or choke on. During the holiday season, people are more inclined to drink and may become loud and clumsy, frightening or even stepping on animals. Also, Christmas crackers and other noisy items may terrify pets. Cats and dogs should have a safe place they can hide away until the festivities are over, and locking pets up in a separate area or room of the house with food, water, and a litter box for the duration of the party is recommended. Not all dangers are holiday-related. Some arise as a result of the cold weather. Cats and other animals may crawl into a car’s engine for warmth in the wintertime. Banging the hood of the vehicle a few times will give any animals inside the opportunity to vacate before the engine is started. Don’t give kittens, puppies, or other animals as surprise Christmas presents. A pet should only be given as a present when the recipient has indicated not only the desire for a pet but also the willingness and ability to care for the animal for as long as it will live. For more Christmas stuff, including gift ideas for people and pets, recipes, and crafts, visit the Christmas page. BC SPCA. (November 2004). “Keep Your Pets Safe This Holiday Season.” SPCA.bc.ca. Root, Louise, Very Important Pets. (2008). “Christmas Pet Safety Tips.” VeryImportantPets.co.uk.